Feme: ProjectAqui: A web application tool developed to explore the statistics of aquaculture in Brazil and South America. 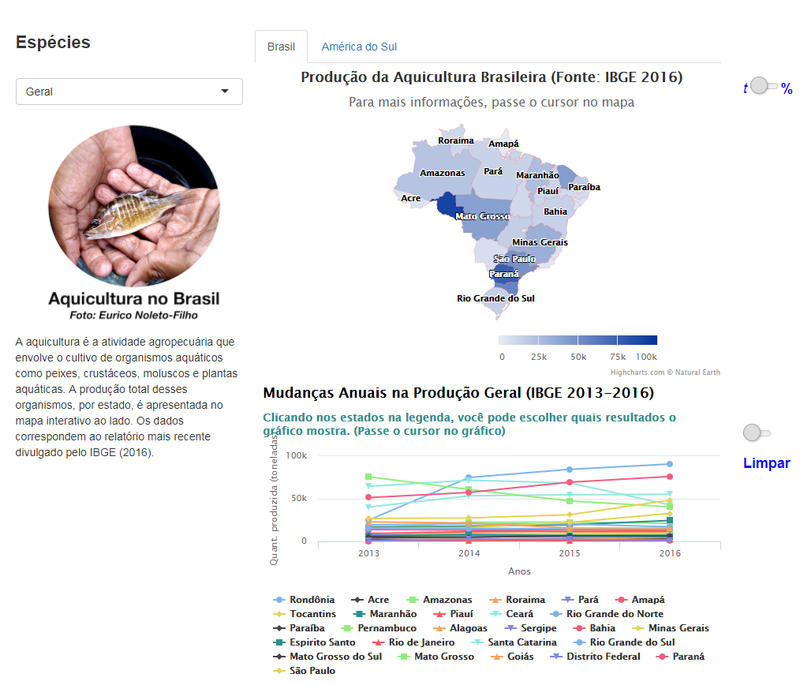 ProjectAqui: A web application tool developed to explore the statistics of aquaculture in Brazil and South America. Regardless of the industry or interests involved, most people have probably heard, at least once, about the importance of having good data. Good data, coupled with good data analyses, are critical to supporting better decisions of any kind, and avoid wasting time. The Brazilian aquaculture industry, together with government agencies, provide a lot of data, which is usually poorly analyzed, which motivated the creation of the web application ProjectAqui. This app was developed to present, in an interactive way, information on the aquaculture production of the Brazilian states and South American countries. It aims to enable policymakers, researchers, and other stakeholders to explore local and continental patterns of growth and decline in the aquaculture industry. The information can be displayed as total production and also sorted by species. The data used correspond to the most recent reports published by the Brazilian Institute of Geography and Statistics (IBGE - 2013-2016) and by the United Nations Food and Agriculture Organization (FAO 2010-2016).